Those words were spoken by Dennis Lucas, a member of Occupy Tacoma and one of the organizers of Occupy the Hood, at a candlelight vigil held in honor of Dr. Martin Luther King, Jr. at Occupation Park. The vigil began at about 7:15 PM on October 15th, slightly later than the scheduled 7:00 start. Occupiers lit candles and stood in a circle on the sidewalk by Pacific Avenue for a moment of silence followed by time of open sharing and discussion. “Martin Luther King talked about the idea of a beloved community, and I didn’t quite get that for a while,” said Jo Walters. Occupiers continued to share their thoughts, both about Dr. King and their visions of an ideal future. Most, if not all, of these idealized worlds reflected King’s own ideas in one way or another. Toward the end of the event, Mike Ladd pointed to another Occupier’s sign, which included a photograph of King being arrested by two police officers in Birmingham, Alabama. 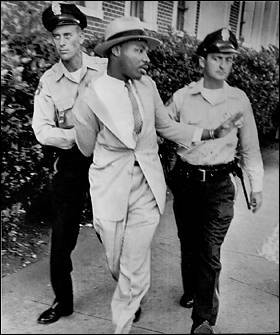 Dr. Martin Luther King, Jr. being arrested in Montogomery, Alabama on September 4, 1958.